We start in Lima, the capital city founded by Francisco Pizarro. Nowadays, it’s touted as a worthwhile and safe visit, but it wasn’t then and there’s a swift departure. The busses are efficient and comfortable and even show movies. Well, one. We watch Analyse This six times. First, Paracas, on the edge of the costa desert, for the Islas Ballestes and the giant sand dunes. The former are said to be a must see on any Peruvian itinerary, though true to form on such occasions the sea is misty and the islands smelly, due to the huge heaps of guano. Nevertheless, seals and quantities of sea birds are discernible. And we don’t have to walk far to see the dunes. They tower over the artificial lakes around the hotel. Dune bashing is on offer, if you are so inclined. Next, the mysterious Nazca Lines. I’ve been obsessed with these ever since I saw Chariots of the Gods. You can only properly view this network of giant desert etchings: geometric figures, animal and plant drawings, from the air. A small plane flight has been booked, but there are only 4 free places and I’m elbowed into the middle of the back seat by a very aggressive German. 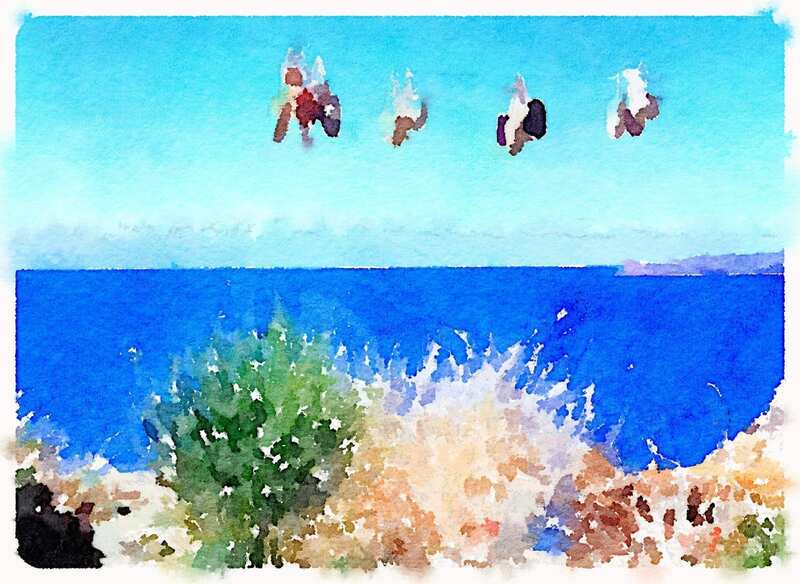 We’ve been warned that the plane banks steeply to get good views and there are plenty thermals with the hot air too. The German is soon throwing up badly, proving that there is a god after all. And one of the pilots takes pity on me and borrows my camera. That explains how I got some pictures, though no-one can explain how the lines were made. Perhaps it really was aliens from another planet. 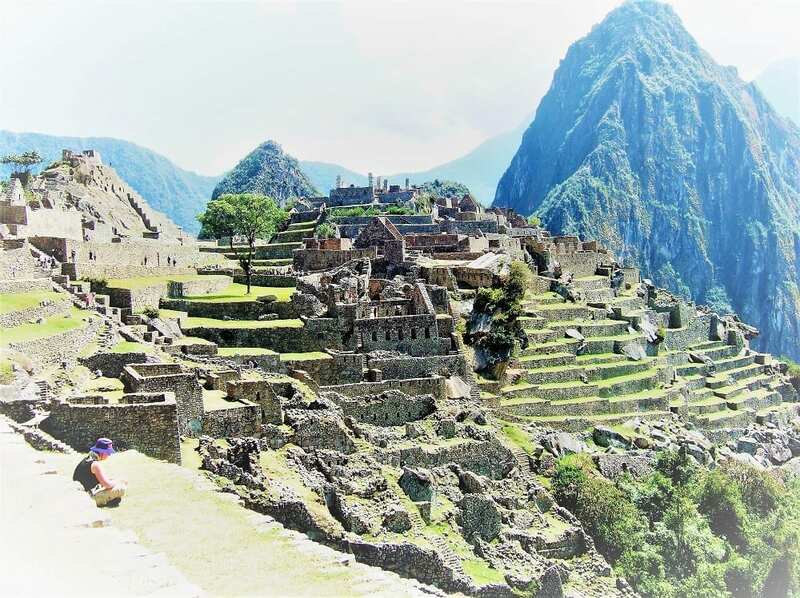 Cuzco and Machu Picchu are almost obligatory on a trip to Peru and they are definitely unmissable. Warding off altitude sickness, here in the high Andes, is the first challenge. There are baskets of coca leaves scattered around our hotel; I’m not sure if they’re working, but they make my tongue go very numb. Cuzco is a tourist hub and trekking mecca, the South American Kathmandu, a gorgeous maze of red roofed houses ringed by mountains. Then it’s a train for an overnight stay in fabled Machu Picchu. This, most famous of Incan ruins, was (re)discovered by American explorer Hiram Bingham in 1911. I wrote an essay on the Incas at school when I was twelve and I’m dredging my memory. It’s not that difficult to recover the facts – it’s a fascinating and frightening story. Peru’s ancient Inca civilisation was larger than imperial Rome and included 24,855 miles of roads at its peak. That’s almost enough to stretch around the Earth itself. It relied on a network of chasquis (runners) to keep the kingdom connected. The first census was created by the Incas. They had no formal system of writing, and so developed a system of record-keeping using different coloured knots called “quipus” made from wool or cotton strings. Their empire was brutally brought to an end by the greedy Spaniards, with conquistador Pizarro breaking his word to the emperor, Atahualpa, after Atahualpa had kept his end of the bargain and filled a chamber with gold. Today’s Machu Picchu has no echo of this violence, surrounded by enchanting white tipped mountain walls. The Andes are truly stunning. 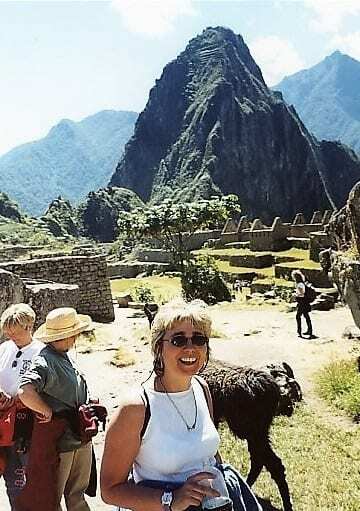 Machu Picchu is at its best early morning and evening, when the day trippers have left. 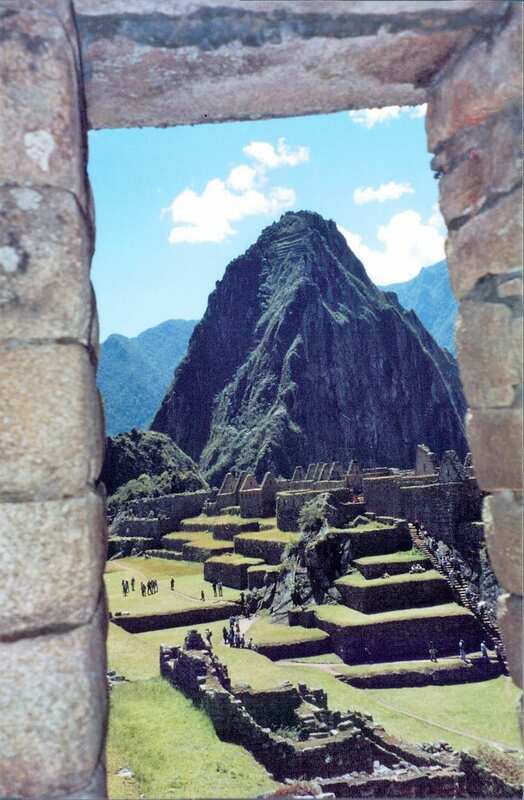 We walk backwards up the last part of the Inca Trail for the famed view through the Sun Gate. We haven’t contemplated walking the trail. It’s been deemed too dangerous over recent years, because of the Shining Path protest raids and besides, I’ve only recently had glandular fever and I understand it’s a very tough trek. Sitting on a stone bench at Machu Picchu, ringed by mountain walls, the electric charge is amazing, energising and wonderful. I don’t want to come down. The staircase descent goes on on for ever, but is preferable to the bus careering round the hairpin bends. The railroad is built right up the main street of the town, Agua Caliente below. You can lean out of the carriage as the whistle blares its warning and do your shopping. Criss-crossing the mountains on buses and trains and sampling the ceviche and pisco (Peru’s national beverage, a brandy made from grapes – it’s also claimed by Chile) in the Cuzco tavernas, we keep meeting the same people, ships in the night. One couple, who had better remain nameless, are working at the same University. Only he is married to someone else and his wife doesn’t know about their relationship – yet. We arrange to meet for a final meal to drink pisco and sample the native delicacy, guinea pig (these are farmed by most of the locals). I have to pass on the food. The guinea pigs are grilled whole, skewered flat, heads attached, complete with little paws pointing upwards in supplication. The pisco sours are much more welcome, however. And I have an empty stomach. I fall instantly in love with a bearded American, Jay, who joins us. He professes to feel the same. It is unfortunate that he is just moving into a shared place with his girlfriend in California, but this is so different and amazing, he promises that he will stay in touch. We can’t let this go, he will come and see me very soon. He writes his email address carefully on a paper napkin and I, just as carefully, put it away. Jaybird -transitory flash of iridescence. Reader, I never hear from him again. Our last spectacular rail journey takes us south, through the mountains to Lake Titicaca. At 12,507 feet above sea level this is the world’s highest navigable lake and coca leaves are still required. It’s a fitting end to a magical journey across Peru, with its reed boats, brightly costumed inhabitants and curious lakeside rituals. On the far side, Bolivia awaits. Peru is divided into three regions: the costa, or arid coastal plain, the sierra, which encompasses the Andes and the Altiplano plateau and the selva, the jungle of the Amazon rainforest that extends east. The Amazon covers 60% of the country, the second-largest proportion of the Amazon rainforest after Brazil, leading to rich bio-diversity. 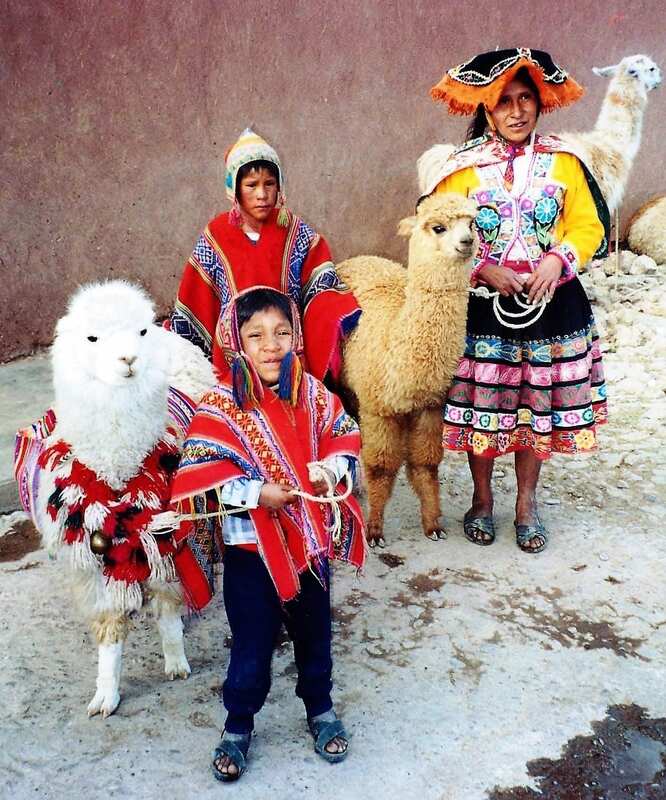 Peru has a multi-ethnic population of over 31 million, which includes Amerindians, Europeans, Africans and Asians. The main spoken language is Spanish. Peru has a long history. 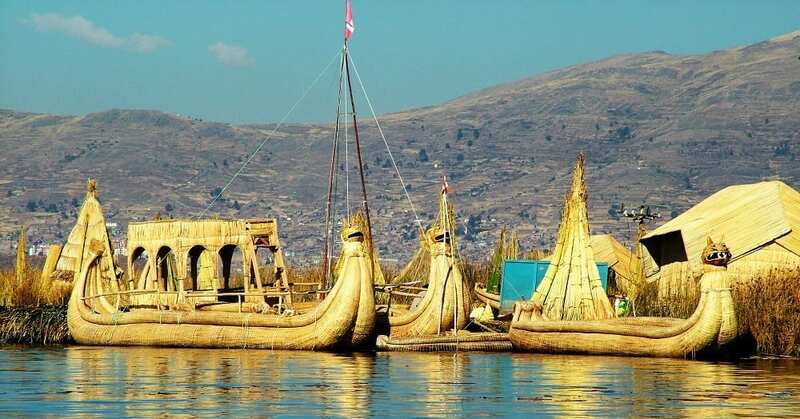 It was home to several ancient cultures, including the lesser known Norte Chico, the oldest civilization in the Americas (3000 years BC) and the Inca Empire, the largest and most sophisticated state in pre-Columbian America. Francisco Pizarro claimed Peru for Spain in 1532. After many wars Peru secured independence in 1824. The potato is native to southern Peru and today, there are over 3,000 varieties grown in the country. The Peruvians have a patriotic saying: “Soy mas Peruano que la papa” (I am more Peruvian than the potato). Peruvians celebrate New Year’s Eve by giving yellow underpants as presents, to bring good luck in the coming year. It is traditional to wear them inside out (underneath clothing) during the day, then flip them around at the stroke of midnight. 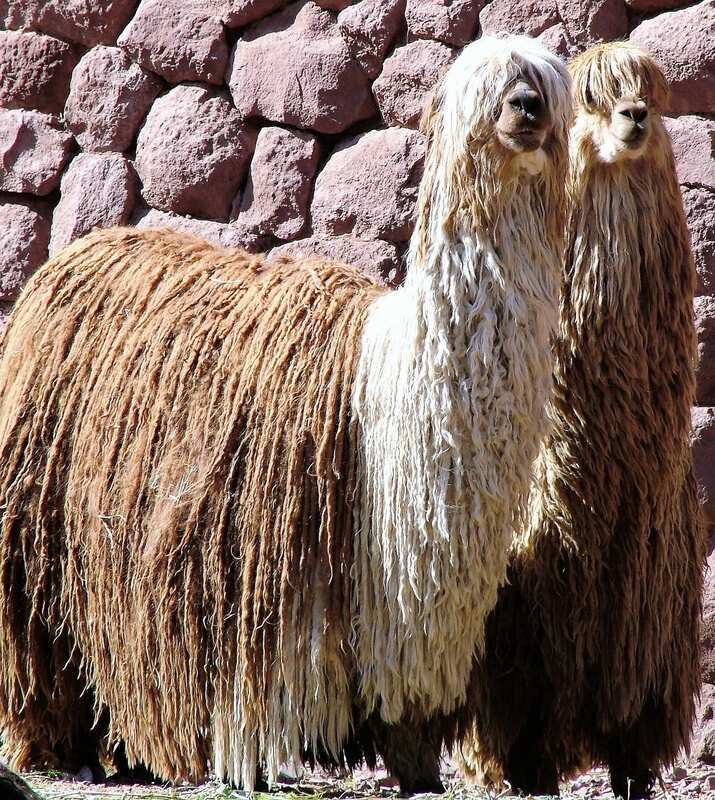 To see more of my photos of Peru, visit this page. Read more about me on the About Sue pages. Get travel advice, compare notes or just start a conversation….